* Please note that there will be camp on Monday July 3rd and that we will observe Tuesday July 4th for the national holiday. 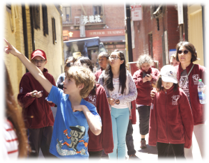 The Mandarin Institute in collaboration with the San Francisco Unified School District (SFUSD) and STARTALK will offer a unique opportunity for ALL Middle School Immersion students and High School students with 1.5+ years of formal Chinese study to immerse themselves in a culturally rich and academically intensive Mandarin program. The instruction is task-based and student-centered. An immersion and multi-sensory language environment will be created to maximize the students’ exposure to Chinese language and culture. Each day, students will participate in 6.5 hours of engaging language and culture study. A very exciting feature to the program is that every student will spend 25 minutes daily via Skype with their own personal instructor situated in China engaged in an authentic cultural learning experience that will enhance their language learning. 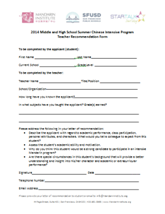 Students in Mandarin/Cantonese immersion middle school programs or recent graduates can apply for the Immersion level. Cantonese immersion students must have completed at least one year of Mandarin instruction. Please note that instruction and materials are in Simplified form, but students can write in either Simplified or Traditional characters. Get on an accelerated track to AP level Chinese! *The registration fee will be refunded if the student is not accepted. Tuition: We only have room for 12 students per class. The program is free for these students, normally a $1800 value! Click the register button below to begin your online application. ALL Middle and High School students from any school are welcome to apply. Applications are accepted based on date received of completed application and availability. Incomplete applications and applications received without the registration fee will not be processed. Applications are processed in the order that they are received. Please contact info@MandarinInstitute.org or (415) 297-1227 for any questions. OUR PROGRAM IS FULL! If you are interested in joining our wait list, please register online and send an email to info@MandarinInstitute.org. The STARTALK Award lets us offer this program tuition free (a $1800 value) to a limited number of students. STARTALK is a component program of the National Security Language Initiative (NSLI) which seeks to expand and improve the teaching and learning of strategically important world languages that are not now widely taught in the US. STARTALK’s mission is to increase the number of Americans learning, speaking, and teaching critical need foreign languages by offering students (K–16) and teachers of these languages creative and engaging summer experiences that strive to exemplify best practices in language education and in language teacher development, forming an extensive community of practice that seeks continuous improvement in such criteria as outcomes-driven program design, standards-based curriculum planning, learner-centered approaches, excellence in selection and development of materials, and meaningful assessment of outcomes.